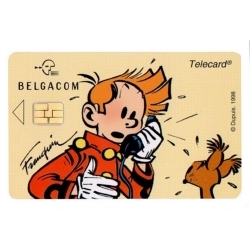 The Proximus Group (previously known as Belgacom Group) is the largest telecommunications company in Belgium, headquartered in Brussels. Proximus Group is primarily state owned, with the Belgian state holding 53.3% + 1 share. Proximus Group offerings include fixed line and mobile communications through the Proximus brand and ICT services to the professional market under the Telindus brand. 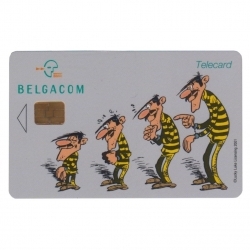 The main legal entity of Proximus Group is Proximus NV/SA, which following integration in 2010 includes the mobile activities of former subsidiary Proximus (Belgacom Mobile) and the ICT services of former subsidiary Telindus. Subsidiaries include BICS, Skynet, Tango, and Scarlet. 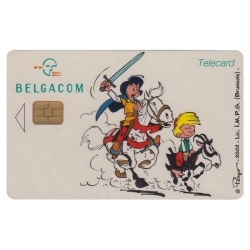 Since September 2014, Proximus becomes the commercial brand of all Belgacom products. 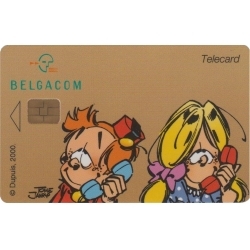 Real Belgian Phone Card Lucky Luke The Daltons (Belgacom company). Delivered in a printed cardboard booklet, with a landscape format, that opens like a book. Limited edition and numbered 2000 copies with certificate of authenticity. 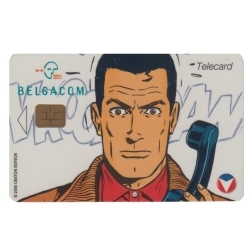 Real Belgian Phone Card of Michel Vaillant (Belgacom company). Delivered in a printed cardboard booklet, with a landscape format, that opens like a book. Limited edition and numbered 1000 copies with certificate of authenticity.